‘Tis the season! Since it’s December, it seems appropriate to do a list of my favorite Christmas themed anime. While most of the entries in this list are forsingular episodes for series, one anime film also made the list. Merry Christmas! As usual, the list is not a Top 5 list. Instead, I am presenting my choices in alphabetical order. 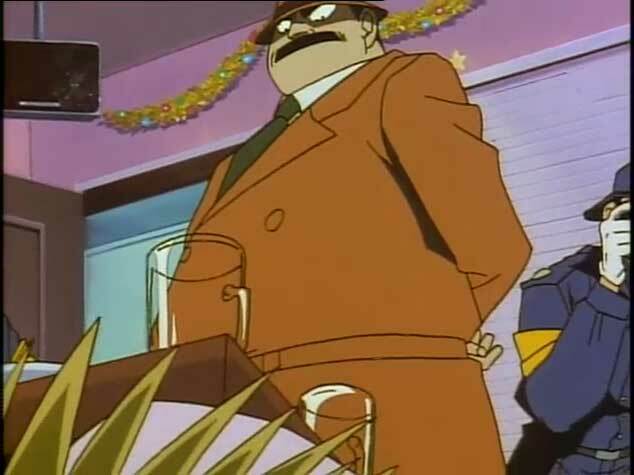 In this episode, Conan, Sonoko, and Ran get to spend time at a Karaoke Bar with the biggest band in the land, thanks to Sonoko’s dad using his connections. But it’snot just any time of year that this is happening: it’s Christmas time. The lead singer is poisoned right in front of everyone’s eyes, and it’s up to Conan to deduce the truth. While it may seem strange to include a murder mystery in this list, the episode still evoked a sense of Christmas. From the decorations in the background to some of the music choices (including one of the characters singing part of “Rudolph the Red-Nosed Reindeer”), this feels like a Christmas episode. I watch the series in the original Japanese, so I enjoy getting to hear part of a classic Christmas song in Japanese. 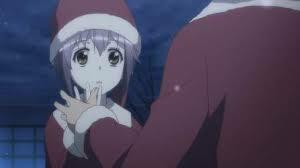 In this alternate world version of Haruhi Suzumiya, Christmas is celebrated by the Literature Club in the first couple of episodes of the series. This is before Haruhi is part of the group, so while there is humor in the episode during the party, it’s not the zaniness that would come along later once Haruhi entered the picture. But there’s also a sweet moment that takes place outside of the school between Yuki and Kyon during the party. Yuki’s bashfulness, especially when she’s around Kyon, is adorable. But the scene that takes place outside saw her almost admit her feelings to Kyon… but Asakura destroys the moment when she leans out the window and exclaims that it’s snowing. This episode is more in the vein of a “traditional” Christmas themed episode than anything else on this list. If I had to choose my absolute favorite on this list, this would be the one right here. Kasumi has a dream that she’s visited by Santa Claus, who tells her to throw a Christmas party for her family and friends. But, it’s not only the main cast who are invited… we also get to see quite a few characters who were either one-off characters or ones who only appeared in a small number of episodes. 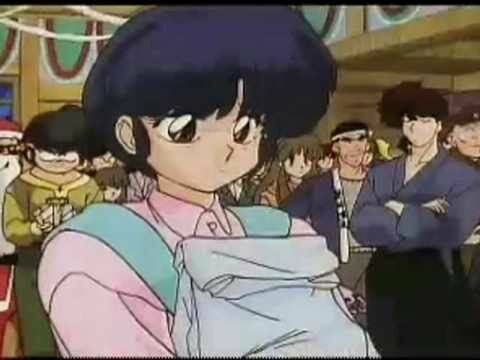 In true Ranma 1/2 fashion, there are hijinks galore, especially when it comes to the various “love triangles.” But for all of its humor, there’s a nice scene between Ranma and Akane near the end that adds an element of seriousness to an otherwise comedic episode. But this works, especially regarding character development. To me, this is a Christmas themed anime that never gets old, and I look forward to watching it every December from the Blu-ray release we have for the Ranma 1/2 OVAs and movies. It’s Christmastime in New Macross City, and almost everyone is in a festive mood… even the three former spies are operating a toy kiosk. The love triangle between Hikaru (aka Rick Hunter), Misa (aka Lisa Hayes), and Minmay (aka Lynn Minmei) plays a central role in this episode. There are some good character moments here, but not just for them. Claudia also gets a poignant moment in this episode as well. 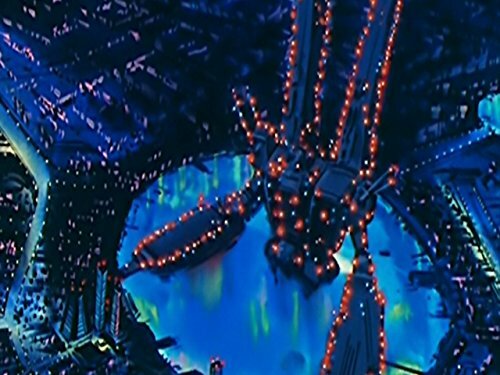 Unfortunately, the Christmas mood is destroyed by an attack that is launched by Zentradi (aka Zentraedi). But, in the aftermath of the battle, the episode still finds time to end with a Christmas dinner for Hikaru and Minmay. As a fan of this franchise, I always enjoyed how Christmas was intertwined with both the character development and the plot progression in this episode. This film by the late Satoshi Kon is set on Christmas Eve and has a story of a newborn baby being found by three homeless people who try to reunite her with her family. In true Satoshi Kon style, this is not a typical Christmas movie. As their search for the baby’s family progresses, they find themselves thrust into situations, such as encountering a yakuza trapped under his car and getting clues about the baby’s mother, being kidnapped by a Latin American hitman, and other situations that help the trio get closer to reuniting the child with her family. 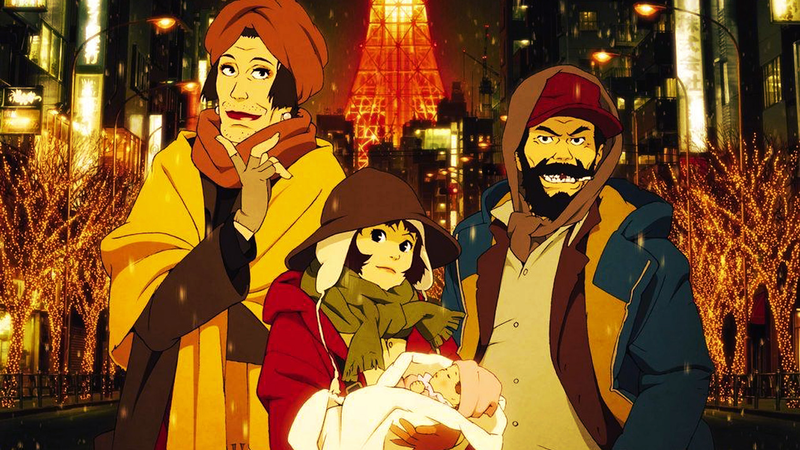 While this may not be a typical “feel good” Christmas movie, there’s still a lot of heart in the story of Tokyo Godfathers. Not only do the characters go through some zany things, but there are also touching character backstory and development moments for the three main characters as well.